Getting closer to being done with our DIY project! Along the way I’ve done some rabbit-trail projects that I thought you may want to try…or maybe you’ve already done them! 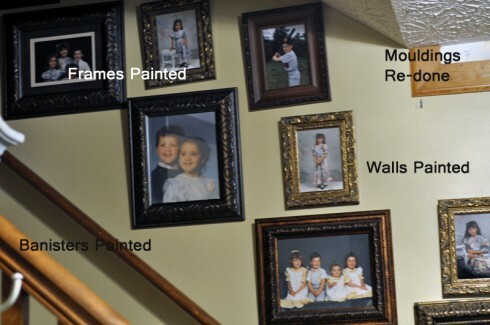 One big-bang-for-your-time project was the photo wall going up the stairs. 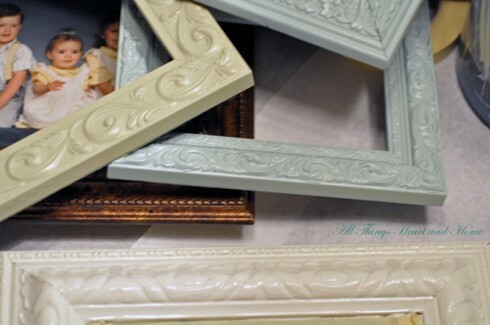 The frames were dark or gold which wouldn’t work but I love all the glorious texture. So I used my 3 inspiration colors (Lots of posts on those colors HERE!) and painted those suckers! As you know, I use Behr Ultra Paint with Primer so they were easy to paint. If you use regular paint you’ll need to prime the frames first. Have a gratifying Monday Peeps! it looks adorable! such a lighter and happier look- love it! hopped over from met monday! .-= [email protected] Stroll thru Life´s last blog ..Metamorphosis in the Making – Family Room Drapes =-. The frames turned out great. Love & blessings from NC! .-= Melinda´s last blog ..Proud to be Southern! =-. 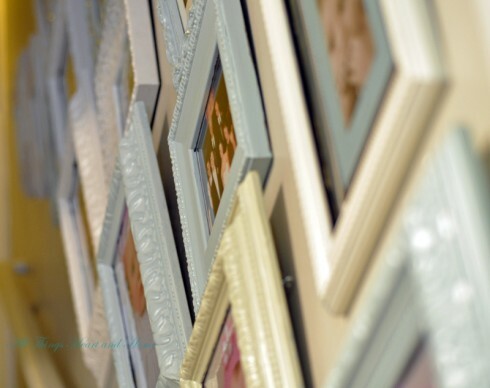 What a delightful transformation…the frames have nice updated look! .-= Carrie´s last blog ..What to Eat for Satiety =-. 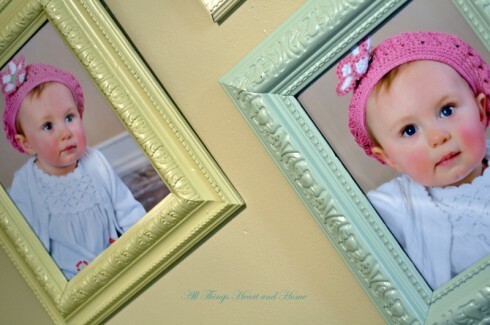 Love the frames, great colors. Very nice. Thanks for sharing. .-= Vicky´s last blog ..Sneak peek =-. 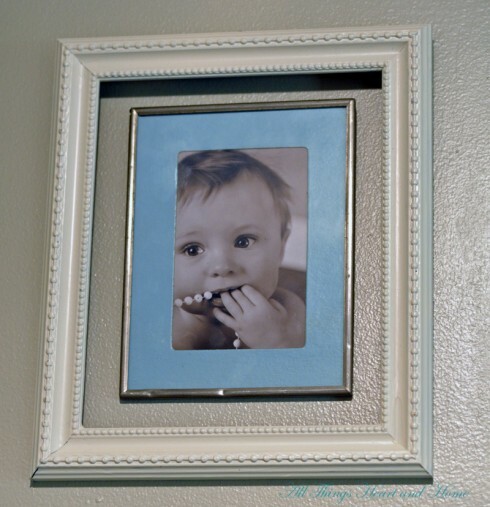 I gravitate to picture frames with textures like the ones you are sharing. I love those colors you have used on them. They look wonderful!! Great job! .-= LdyDy´s last blog ..Garden Gloves on Lets go shopping! =-. These turned out awesome. 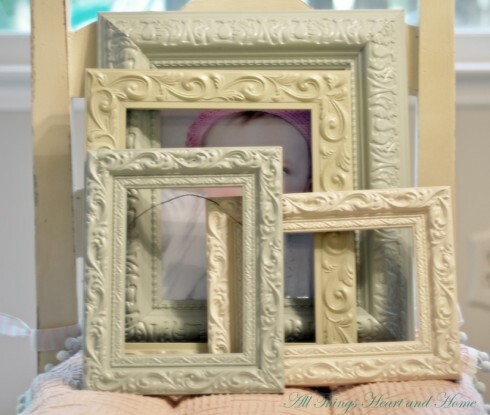 I painted some frames this weekend that I am making into chalkboards. 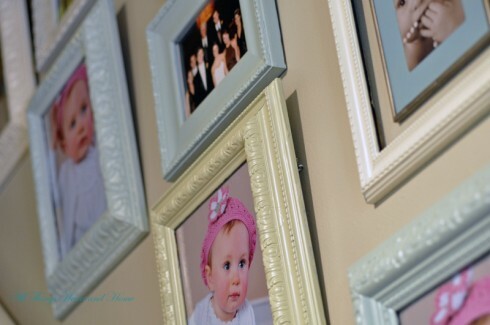 I think I am going to search for more frames and do a grouping like this going up our staircase. .-= La´s last blog ..Craving- A Gooey Cinnamon Roll =-. What a difference paint makes. It looks so much brighter and happier now. Thanks for sharing. Wow–Elllie looks like Baby Stephanie did!! Beautiful handiwork, Rob. Wow, What a change I love the colors and the end result is amazing! .-= ~ ~Ahrisha~ ~´s last blog ..A Sunshine Yellow Ribbon =-. they just look wonderful and add extra charm to photos. .-= rose´s last blog ..HODGEPODGE =-. Oh they look just wonderful! Isn’t it amazing what some paint can do to totally chnge the look of a space!!!! I love it! .-= Eileen´s last blog ..Summer Flowers =-. Gorgeous! Love their new look! You’re frames look gorgeous! Since you are most definitely the queen of Behr paint w/primer now,wonder if you could give me some advice. I need the repaint 2 pieces of french provencial furniture and an iron bed. What would you recommend for a classic color for the furtniture for my little girls room? Also, have you painted on iron with that paint yet? Thanks for any help you could offer. Great idea! 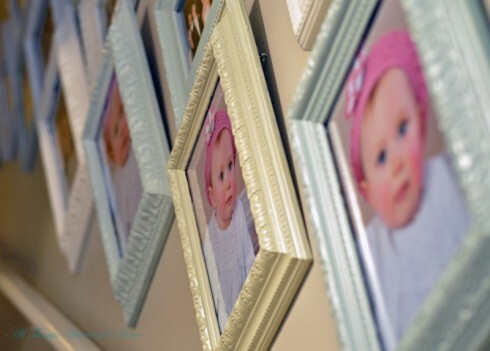 Love the texture of the frames too! .-= Jody Smith´s last blog ..On my way to a baby shower =-. .-= Susan´s last blog ..Camp Susu Snacks—Peanut Butter and Chocolate Cupcakes =-. When God gave you the word friendship for the year I don’t think he meant with Behr paint and a paintbrush! Ha! I did try the paint at Nathan’s house. I only had two days to get as much done as possible. It worked great! I was painting light colors over hideous dark beige walls and it only took one coat. So now that I am working on my house I am using it here. The only problem is our small town doesn’t have a Home Depot so I have to drive to the city to get it…oh well. So worth it. Next time I am in Atlanta, I want to see it in person! I like the frames so much better painted. Lovely! .-= Carmen´s last blog ..Dresser Inspiration =-. I love the lighter look. Very nice! Isn’t amazing what some paint can do? I LOVE the new look!! I was JUST looking at my picture wall yesterday thinking I should do the same thing! But, I am not sure how? Girl, this is so awesome!!! I’m amazed at all you have done, and I have so much to catch up on I know I’ve only seen the tip of the iceberg. .-= gitz´s last blog ..YOU-create Week 4 =-. .-= gail´s last blog ..Recent Comments &amp Questions August 7- 2010 =-.